1) Go for walks more often. 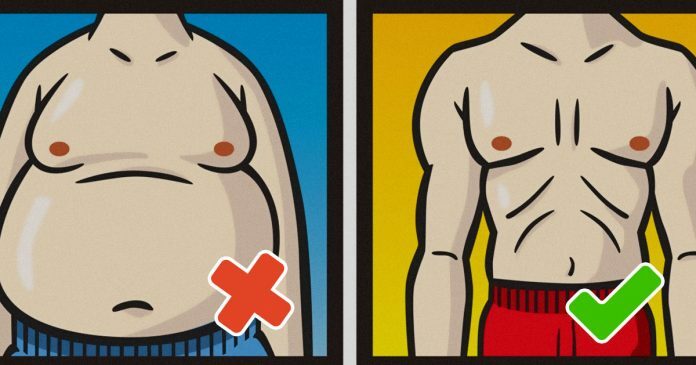 One way to really lose your gut is by being more active. Even small stuff like going for walks burns pure fat. If you are really out of shape then it would be a bad idea to go for a couple of walks a day. 2) Eat unprocessed foods. Eat more foods like lean meats, vegetables, fruits, and nuts are all very good for you and teach your body to burn more fat. Avoid junk food most of the time and replace it with these kinds of foods. 3) You can cheat on your diet once in a while. You can have a cheat meal once every 2 days. Just make sure you eat healthy foods 90% of the time so you can allow yourself junk food like pizza, ice cream, and chocolate chip cookies. 4) Start exercising. Start doing basic exercises like body weight squats, the plank, and push ups. Exercises like these strenthen your core and work more than one muscle group so you can expect to burn more fat. 5) Forget about doing crunches. Basic crunches on the floor is not effective. All it does is strain your back and neck especially if you do over 50 at a time. Instead do exercises that actually target your abdominals and burn more belly fat. 6) Do reverse crunches. These are the opposite of regular crunches. They really hit your abs without the strain on your neck. Do them by laying on the floor with your legs up in the air and your knees bent. Bring your knees back so they almost touch your chest and then back to the starting position. 7) Lose your gut by drinking water. Thats right, water helps wash away your gut. For every cup you drink you burn about 8 calories of pure fat. It keeps you hydrated and energized. Drink at least 6 glasses a day. 8) Get more fiber in your diet. Foods like fruits,vegetables, beans, oatmeal, and nuts are all loaded with fiber. It is great for your digestive system and keeps you feeling full longer. 9) Drink green tea. It is very powerful for losing belly fat. Full of disease fighting antioxidants green tea is known the the best natural fat burner and it is probably the cheapest. 10) Eat more protein. About 30% of calories in protein are burnt off during digestion. Not bad when comparing that to calories burned from carbs which is only about 8%. 11) Limit your carbs. Food like bread, rice, oatmeal, and potatoes should be conusmed only either early in the morning or after a workout. Otherwise they will most likely turn into fat for not being burnt off right away.